Carpet cleaning: At Lov ‘N Kare Carpet Center, we’ve been cleaning carpets for over 65 years, and employ a 10-step process to ensure our customers receive the finest service and the cleanest carpets. After a thorough inspection, our team will vacuum and pre-treat your carpet before proceeding with hot water extraction cleaning. We’ll neutralize your carpet, treat any remaining spots and let you inspect the results before we’ll consider our work finished. Spot cleaning: Our steam cleaning services can also be applied when a specific area of your carpet has suffered a spill or is looking worse for wear. As the premier source for carpet cleaning services in South Amboy, NJ, we trust you’ll be pleased with the results of our spot cleaning services. Steam cleaning, as performed by carpet cleaning professionals, is the most effective method for removing soil and leaving your carpet looking its best. Water damage restoration: A flood, burst pipe or major plumbing disaster can cause considerable damage to your carpet—and quickly. Within the first 24 hours after water damage is sustained, call Lov ‘N Kare Carpet Center and we will arrive with our heavy duty water extractors to begin the process of saving your carpet. Using industrial-sized fans and dehumidifiers, we’ll work to dry your carpet and prevent mold and mildew from developing. At Lov ‘N Kare Carpet Center, we’re committed to providing high quality carpet cleaning services in South Amboy, NJ and beyond. 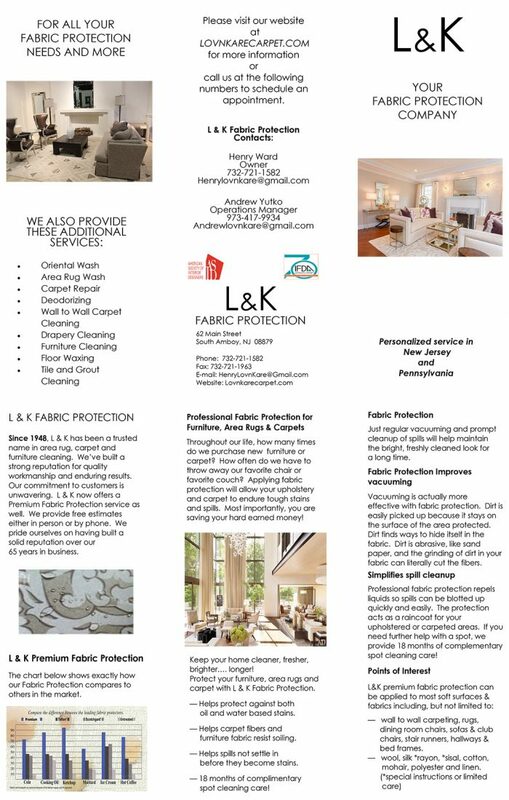 To request our services or learn more about how we can help you, please call us today at 732-721-1582.